All kidding aside, it can be tricky when teaching the seven days of the week in English, because the names of the days don’t really mean anything in relationship to the actual day. Maybe if it was always sunny on Sunday this would help, but we know that this isn’t actually true. So, what we are left with is basically practice and repetition, practice and repetition, and practice and repetition. Did we mention practice and repetition? Luckily, we can deal with those repetition blues by adding great sounds and melody to words to create a little thing we like to call: music. Music can help with memorization because it can make words like the days of the week memorable and fun! How many times do we have to tell you Gerald, a stinky sock is NOT a day! 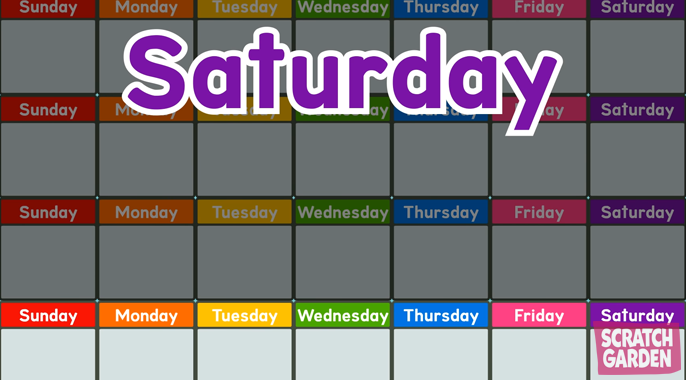 We thought that the best thing (besides music) for learning the seven days of the week was to point out all the things that are not days of the week. 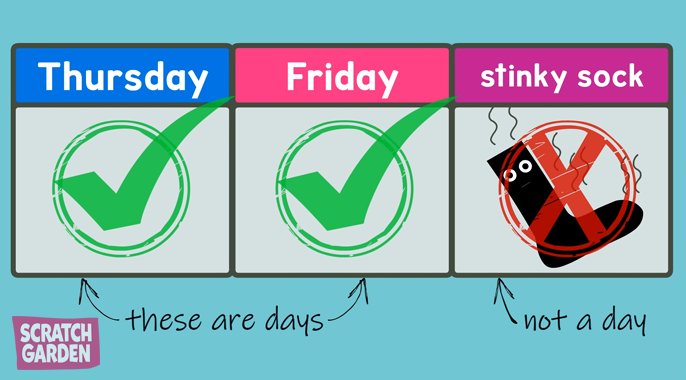 A stinky sock for example is not a day of the week. A tiny pizza is not a day of the week. Other things that are not days of the week include: a pink piano, a house with a face, and an angry banana. We could go on but maybe you should see for yourself! Even if you are not a kid, watch the Days of the Week Song Video to laugh, and learn the days of the week. « More Scratch Garden Music is Here!